architecture attempts to express a 'non-institutional' alternative type of college. All the buildings are 2-storeys and located along a pedestrian street route." -Dennis Sharp. (Twentieth Century Architecture: A Visual History, 310). "The L-shaped layout rambles through a redwood forest, widening, narrowing, twisting along its central 'street' in his version of the 'Italian hill town'. Paradoxically, Moore vividly evokes the picturesque vitality of the hill town by fronting the street façades with a varied series of stuccoed, trabeated screens, stairs, and 'arches'. These flimsy-looking, Pop-Hollywoodish forms are accented with bright, primary colors at strategic places, marking with 1960s irony as 'monuments' such functional banalities as a public telephone and laundromat." -Marvin Trachtenberg and Isabelle Hyman. (Architecture: from Prehistory to Post-Modernism, 568). 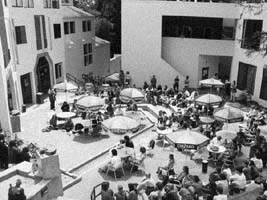 "In the late sixties, the Moore group, designing Kresge College for the University of California at Santa Cruz, developed a totally theatrical-like painted stucco environment almost dancing in and through the landscape. For the college, Charles Moore and William Turnbull have designed a village street, one that is intimately defined by irregularly punctured false fronts of free-standing appearance and almost cardboard cut out feeling, of white painted stucco with accent planes of primary colors, where spaces are animated by social facilities and oriented to a sequence of plazas and gardens, all threaded, in what initially seems to be somewhat incongruously, through a redwood forest setting. 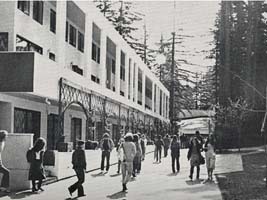 Facades of buildings facing the trees are muted by being painted a dull brown color. The traditional college campus hierarchy of buildings and spaces, sequentially and predictably shaped and axially related, is rejected (the traditional sense of permanence and quality of detail and execution has also been surrendered) in favor of a 1,000-foot-long winding street rising 45 feet up the site to an octagonal dining commons and assembly, and a space looking toward a fountain at the ridge. The whole visually appears as a randomly disposed flow of space with shifting glimpses of views through facade cutouts of planes and planes to woods; the converging juxtaposed to the diverging. 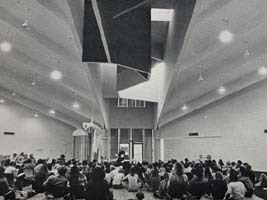 Patterns of human association, the notion of students as a strictly transient and social population, sensitivity to sight as a form potential both innately of its own characteristics and philosophically of the architects' intent to appropriately shape building in it in response to the traditional campus problem. The lined-up courtyards and sophistication of Oxford and Cambridge, are replaced by the crooked mixes and cruder, playful forms of Kresge. It is a college in search of dialogue, an attempt through sight and association to create a highly personal and involving sense of place." - Paul Heyer. (American Architecture: Ideas and Ideologies in the Late Twentieth Century, 108).